Victoria Newell looks at where she was two years ago and says she can’t believe she’s come as far as she has. Newell credits AAPS Adult Education and its new Career Navigation Program for much of her recent success. Adult Ed serves more than 400 students each year. About half are enrolled in English as a Second Language; and the others are enrolled in either the GED or high school completion for adults diploma program, which has grown from five to 25 students in three years. Through the Career Navigation program, Newell was introduced to a recruiter from Rainbow Rehabilitation in Ypsilanti. Knowing she needed a diploma to get a job there, Newell says she doubled down, worked even harder on her reading and writing, and was hired after receiving her high school diploma. Her mother passed away when she was a young child, so Newell took her diploma to the gravesite to show her mother that she’d made it. That diploma was also a big source of pride for her father, said Newell, who is now enrolled at Washtenaw Community College with plans to become a nurse. “I would have never pictured myself being where I am today,” said Newell, thinking back to two years ago. 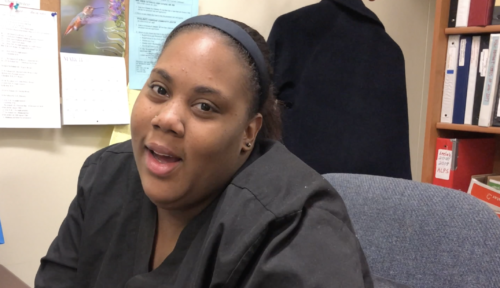 AAPS Adult Education’s Career Navigation Specialist Jackie Scott is proud that Adult Ed offers students a certificate program they can use to enroll in a skilled trades training program. She said Adult Ed is in the process of building a partnership with the American Center for Mobility at Willow Run, a 500-acre center for testing and validation, education, product and standards development related to connected and automated vehicles. Adult Ed also offers wrap-around services for returning citizens who have been incarcerated and are now returning to the community. One such student graduated with Adult Ed, enrolled at WCC, and connected with the United Way’s A Brighter Way mentorship program. For more information on AAPS Adult Education, click here.